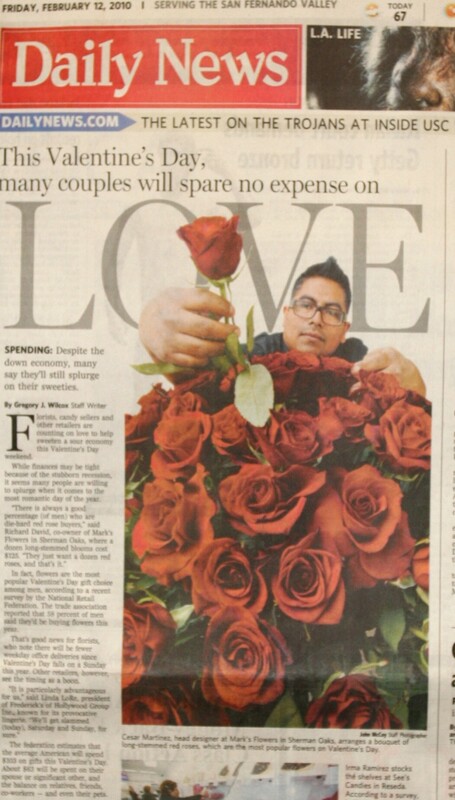 That's our Head Designer Cesar making up an arrangement of five dozen roses for one of our favorite clients. Frankly, we don’t even know how it happened, but Mark’s Garden ended up on the front page of the Los Angeles Daily News yesterday, above the fold. It’s was right there above the story about Bill Clinton’s heart procedure and a story about a woman found guilty of setting fire to a bikini dancer. 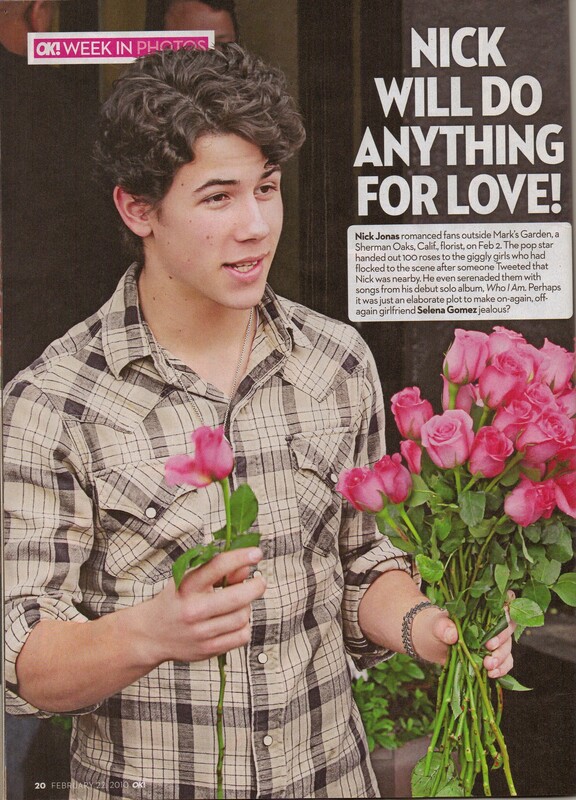 We guess the editors thought LOVE was a better story for Valentine’s Day than all of the other stuff that’s happening. We agree. It comes at the end of a week of non-stop media exposure for Mark’s Garden. Along with Tuesday’s international press preview for the Oscar’s Governor’s Ball, Los Angeles Confidential Magazine displayed our English Garden Basket on the KTLA Morning News that same morning. Wednesday, stories continued to proliferate on a variety of TV news shows and the internet, not only about the Oscars but about the Nick Jonas appearance last week. Thursday night, EXTRA profiled Mark’s Garden and the store was named in the story line on ABC’s drama Private Practice. 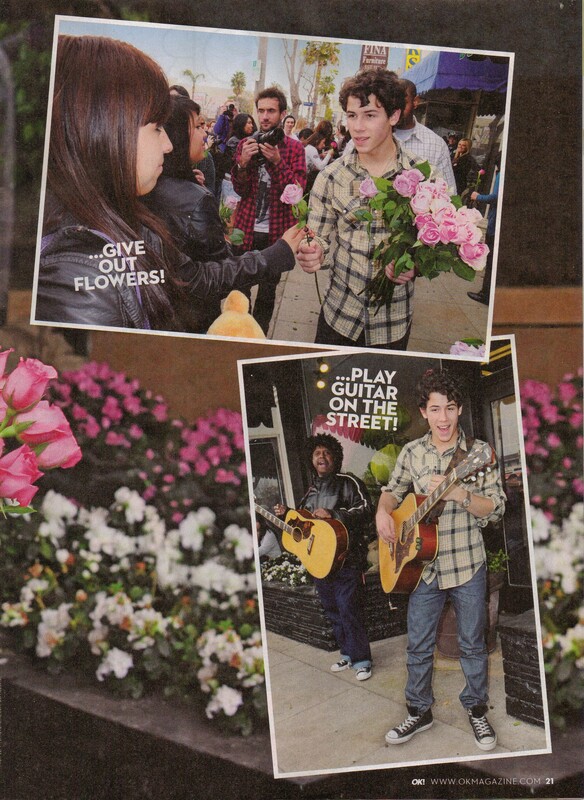 Today, someone brought in OK Magazine, and there is Mark’s Garden again, in a double-page spread, with Nick Jonas (once again) handing out roses in front of the store. It’s been quite a Valentine’s week. 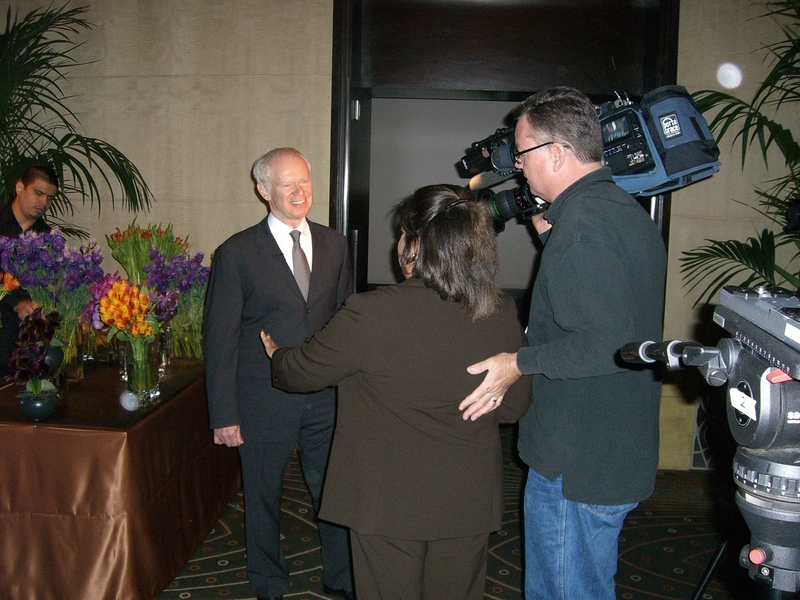 Mark being interviewed by CNN. For the 17th consecutive year MARK’S GARDEN is designing the floral decor for at the Academy Awards Governors Ball. Today was the press preview to sneak peek the look of the Ball. This year’s floral décor uses a mix of exotic orchids, tropical blooms and roses set in an eclectic collection of ceramic, glass and metal containers. The Governors Ball is held in the Grand Ballroom on the top level of the Hollywood & Highland Center® immediately following the 82nd Academy Awards® telecast. The historic architecture of Paul Williams and interior designs of Dorothy Draper in the 1930’s and 1940’s were our inspiration, along with the feel of the famous old Hollywood night clubs The Mocambo and Ciro’s. But the overall effect is definitely modern. There will be fifteen different table top combinations featuring floral “sculptures” of varying shapes and sizes. The designs incorporate the Ball’s purple and orange color pallet. Arrangements will be set in an array of graphite, silver, copper, glass and mirrored containers in rectangular, cylindrical, elliptical and free form shapes. Tightly clustered bouquets gathered and angled in tall glass cones will tower above some tables while low slung containers with coordinated bouquets will sweep low across others. Mirrored bases and copper-toned votives combined with custom lamps will cast an indirect glow across the tables. The flowers used include deep purple Calla Lillies, Orchids, Roses, Tulips, Lisianthus, Protea and exotic leaves. They come from all over the globe including Hawaii, Singapore, Holland, and Ecuador as well as the United States. 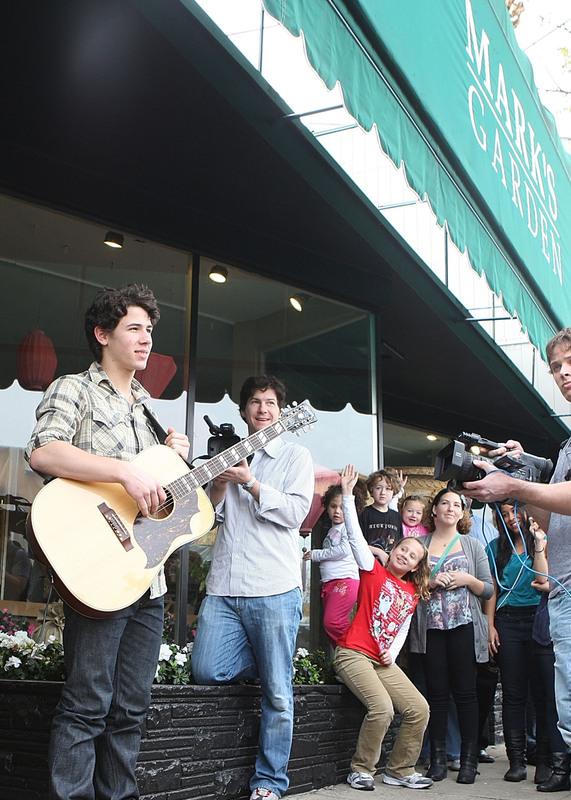 Mark’s Garden was center of the universe for a lot of young girls on Tuesday when pop idol Nick Jonas staged an impromptu concert in front of our store. He sent the word out first on Twitter that he was coming to Mark’s Garden and within moments girls were running to the store and literally calling from all over the country to tell us to say “hi” to their heartthrob… before we even knew about it! After performing a few songs, including “Rose Garden,” the first track on his new CD, he passed out roses to 150 of his fans. Then he dashed off to make an appearance on “Ellen.” You can catch some of his appearance on You Tube. You never know who is going to show up at Mark’s Garden.